Loudspeakers can demand lots of current and you can imagine that the best connection to the amp would be a direct connection. But in the real world we need a cable. And while it is still best to keep that cable as short as possible, the best loudspeaker cable is going to present a low resistance across the entire audio bandwidth. Solid core can't do that. A billion bare strands can't do it either. Only Litz construction will ensure the lowest resistance from lows to highs. KAB SpiralVoice speaker cables are an efficient and cost effective loudspeaker cable. Don't be fooled into thinking you need to BiWire your loudspeakers. There's no such thing as bass wire and treble wire. That's just a good way to get you to buy more wire! In fact, those that shun Litz in favor of Bi Wiring are actually making the best case for KAB SpiralVoice cables. Bi Wiring is often sold on the idea that you can improve clarity if you separate the bass electrical currents from the treble electrical currents. And you know, there is some truth to that, but it is only true because conventional bare conductors lose detail to the skin effect. They are not efficient AC conductors. Litz conductors do not lose detail to the skin effect. The Skin effect describes how audio currents travel through a conductor. Low frequencies occupy the entire conductor, whereas high frequencies tend to crowd into the outer edge or "skin" of the conductor. So from a measurement point of view, the conductor does not have the same resistance at low frequencies as it does at high frequencies. This is also how the solid core people use their cables like a "tone control". Litz conductors have a uniformly low resistance across the audio band. Litz conductors are efficient and as a result, they perform even better than bi wiring with non Litz conductors. By choosing Cardas Litz wire, we are assured of pure poly-nylon coated copper strands, and their proprietary Litz winding technique called Golden Stranding. Golden Stranding minimizes the skin effect by winding the conductors in such a way that brings each strand to the outside of the winding in a repetitive pattern. In addition an opposing spiral winding is applied to the strands in addition to spiraling the two main conductors as well. In this way electro - magnetic field interaction is minimized. Finally, because the strands are coated with a poly-nylon film, they will never oxidize and that means the fidelity of KAB SpiralVoice cables will never change. Non Litz cables always carry the risk of aging due to oxidation effects. KAB believes that when it comes to speaker wire, you want that wire to behave as if it were a direct connection to the amplifier. Just like our SpiralAir interconnect cables, KAB SpiralVoice loudspeaker cables prove that a simple design using the right materials and process can produce a great cable. Litz cables are labor intensive to produce and will cost more than non Litz, but the improvement in clarity and longevity is worth it. 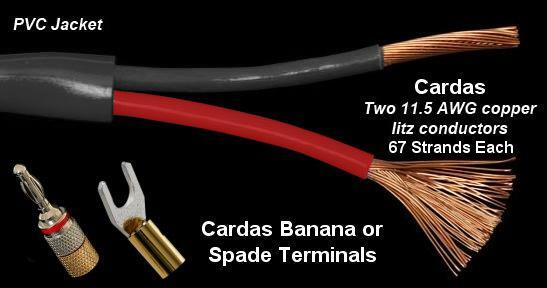 KAB can terminate your SpiralVoice cables in Cardas bananas, spades or combination of the two..
Order KAB SpiralVoice Loudspeaker Cables Below. Consult with us for custom sizes. 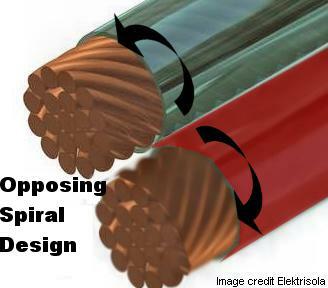 By using Litz conductors in an opposing spiral design, KAB SpiralVoice Cables acheive great results with the simplest possible design. By using Litz conductors KAB SpiralVoice Cables achieve wide bandwidth. Litz winding retains a low resistance at the lowest and highest frequencies. Making KAB SpiralVoice Cables the closest thing to a direct connection from amp to speakers. What's not always appreciated about Litz wires is their longevity. All bare wires are subject to the risk of oxidation. Oxidation causes non linear interaction between the strands which effects subtle details in the sound. Because each Litz strand has a poly nylon coating, KAB SpiralVoice Cables will not oxidize over time. And even if they did, the poly nylon film would prevent any interaction between strands from occuring. The dielectric is the insulator. Insulators are assigned a number that describes the reduction in wave propagation speed through it. For example, air is 1, Teflon is 2, thin silicone is 3, PVC is 3.4, water is 80. That is the dielectric constant. And it is only meaningful if both send and receive conductors are immersed in the same dielectric, and if the cable is long enough to contain a quarter wavelength. Many websites spin long yarns about how audio waves propagate through cables.And by the time you wade thorugh it all, your thinking to yourself, Wow, this must be really important! But while it is true that higher dielectric constants will reduce the speed that a wave travels down the wire, it is important to consider that audio is measured in milliseconds, cable velocity effects are measured in nanoseconds. That's a ratio of a million to one! I found one reference that really nails this down: "If a long line is considered to be one at least 1/4 wave in length, you can see why all connecting lines in low frequency systems are assumed short. For a 60 Hz AC power system, power lines would have to exceed 775 miles in length before the effects of propagation time became significant. Cables connecting an audio amplifier to speakers would have to be over 2.3 miles in length before line reflections would significantly impact a 20 kHz audio signal! " 1/ Now imagine the impact 3 ft of interconnect or 10ft of speaker wire has on velocity? Now, capacitance per foot is still important in hi output phono interconnects. It is important to know capacitance so you can compute the total for your particular phono cartridge. The Cable capacitance adds to the preamp internal capacitance to produce the total. Dielectric absorption is the name given to the effect by which a capacitor, charges and discharges at different rates. Some believe that cable capacitance can contribute this effect to the passing audio signal causing coloration and loss of fine detail at low levels. The lower the dielectric constant, the smaller this phenomenon is. In a solid core or bare stranded wire cable, the bass frequencies occupy the entire cross-section, while the high frequency currents tend to crowd into the outer edge or "skin" of the conductor. First discovered in arc welding systems. It was found that with extended cables, high frequency welding systems failed to work efficiently. The term litz wire originates from Litzendraht (coll. Litze), German for braided/stranded wire or woven wire 3/. When a cable using Litz techniques was used, it was found that long cables could be used efficiently. It is only natural that this technique would be useful in audio as well. Litz wire describes a construction that attempts to optimize transmission efficiency across a wide range of frequencies. It does this by reducing the skin effect. A litz wire will be made up of many strands of wire, each strand individually insulated. The diameter of each strand is chosen to ensure that at the highest frequency, the electrons occupy the entire cross section of that strand. The strands are then bundled together to achieve the desired gauge and wound in a special pattern that ensures that each strand appears on the outer edge of the conductor, repeating over and over as the wire is produced. Also as each strand is individually insulated, there can be no latent oxidation or interaction between strands. The advantages of Litz wire are many. I can think of no negatives. I believe that the most neutral sound will come from pure conductors. This makes sense if you understand skin effect. The skin effect describes how higher frequencies currents tend to crowd into the outer edges of the conductor. If you plate the copper, you introduce skin effects that affect the treble quality. Tin plate will lose detail, Silver plate will enhance detail. Our general recommendation is to only use plated conductors in places where the cables can be easily changed. And to not use plated conductors at all if you are interested in neutral reproduction.